Google has involved itself in some of the thorniest U.S. foreign policy issues. Is it conducting backchannel diplomacy on behalf of the United States, or for its own business interests? 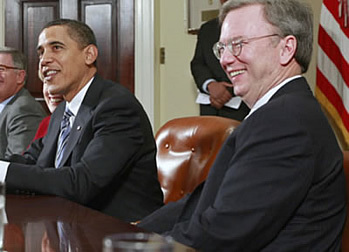 When Eric Schmidt flew to Cuba on his private jet in 2014 with three other Google executives, company lawyers told the U.S. government it was strictly for academic research purposes.1 Newly unearthed documents suggest they may have stretched the truth. Once they arrived on the island, however, the Google executives embarked on a packed agenda of meetings with officials that act as gatekeepers to the Cuban internet, including from Cuba’s state telecom body, the state internet service provider, and the government body that runs public internet “cafes,” according to a detailed schedule for the trip. Google’s early trip to Cuba—made ostensibly for academic research purposes—turned out to have broad commercial implications for the company, putting it in pole position to connect one of the largest remaining virgin markets in the hemisphere. Google’s successful Cuban foray in 2014 was organized by Google Ideas, the company’s internal “think/do tank,” which has since been renamed Jigsaw.23 In its Treasury application, Google portrayed the unit as a purely philanthropic endeavor unconnected to its business. Most of the international events it sponsored were attended by the company’s top business development executives. Tellingly, Google Ideas originally resided not in the company’s philanthropic arm, Google.org, but in Google’s Business Strategy division.26 Its goals mostly dovetail with Google’s commercial interests. While the Google executives painted their visit to Cuba as part of a global mission to challenge autocratic regimes, actual academics have been skeptical of Google’s reasons for promoting free speech online. “In this specific case of Cuba, Google has no commercial interest,” company lawyers wrote. Google’s use of its Washington ties to further its business interests abroad stretches well beyond Cuba. A detailed review of Google’s cooperation with the U.S. State Department shows the trips fit a pattern, as the company worked hand-in-hand with the foreign policy establishment, furthering the Obama administration’s goals while using its influence around the world to secure a competitive advantage in newly-emerging markets. Under Cohen’s direction, Google Ideas began to play an increasingly active role in U.S. foreign policy issues, with the State Department at times appearing to outsource part of its public diplomacy mission to the company.39 Google carried out a wide range of missions in coordination with the administration, aiding U.S. internet propaganda efforts and other advocacy projects that, Cohen said, were too sensitive for overt efforts by the U.S. government. But those efforts—and the group’s lofty rhetoric—obscure the business objectives behind many of its activities: opening new markets for Google. With their frequent visits to reclusive and repressive regimes, some well-connected people began to suspect Cohen and Schmidt were conducting their own back-channel diplomacy on behalf of the White House, pushing technology as a means to foment civil unrest. Even senior executives at Google itself began to suspect Cohen was working on behalf of the White House, according to leaked emails from Stratfor.com, the private strategic intelligence platform. “Google believes he’s on a specific mission of ‘regime change’ on the part of leftist fools inside the WH who are using him for their agendas,” wrote a Stratfor executive who claimed to speak regularly to Schmidt and other Google executives.46 After more digging, the Stratfor executive came to a clear conclusion, echoing Cohen’s own description of his new role as being able to do things the U.S. government cannot. Google officials eventually moved to rein-in Cohen. They pushed back against a planned trip to the Iranian border, calling him a “lightening rod” and “instigator,” according to emails to Stratfor.48 But Schmidt didn’t shy away from public discussion of controversial U.S. foreign policy, using a blog post after his June 2014 trip to Cuba to call for an end to the U.S. embargo. Google’s early lead in Cuba has positioned the company to gain access to the personal data of millions of new internet users for its advertisers. But Schmidt’s Cuba adventure is only one example of how Google’s business interests became deeply intertwined with the Obama administration’s foreign policy agenda. 1 Flight records show a Gulfstream G5 registered by Eric Schmidt with tail number N785QS flew from Miami International Airport to José Martí International Airport just outside Havana on June 26, 2014, returning to Miami the same day. The Gulfstream G5 made a second round-trip from Miami to Havana on June 28, 2014. 17 The trip was nearly derailed by weeks of wrangling by career Treasury officials over whether Google’s existing general license would cover the trip, and whether they could bring their own flight crew, the documents show. The additional license was ultimately greenlighted the day before the planned trip. A Treasury official had warned colleagues they might “get calls about this,” possibly an indication they understood the political sensitivity of the issue within the administration. 50 The post on the now defunct Google+ appears to be the only effort to deliver on the executives’ promise to publicly disseminate the results of their academic research.